Roadtrips can seem like a form of torture for some people. The long hours, the lack of wifi, and the uncomfortable seating can make any kind of bus or car travel seem like the worst idea ever. However, traveling on a coach bus isn’t so bad when you have some ways to pass the time. At GOGO Charters, we not only care about the comfort and safety of your trip, but we want you to enjoy it too. We have equipped our buses with wifi and comfortable seating, admittedly this is not a full blown party bus, but you’re never too old to enjoy a nice game that will help you pass the time. Whether you are traveling in a group full of people you know in Salt Lake City, or you are riding along and looking to make friends in San Francisco, we have the quintessential list of games to play on your journey. Time will go by faster, you will laugh, and you will bond with your trip mates more than you ever could if you were just listening to music or playing games on your phone. We know, we know, when you are stuck on an 8-hour road trip, it’s fun to poke your friend in the arm 100 times in a row. Well fear no more friend, you have an expert here with all of the activities and games to play on the road. Let us give you a little insight on how to keep yourself completely occupied on those extra long trips. Check out these 10 games to play on a road trip that will keep you entertained throughout your bus trip. Pen, paper, cards or your imagination are all you need to get these games going. Whether you’re reading this before your trip, or stumbled across it while on the road already, there is a game for every kind of traveler. The goal of the game is to eventually win all of the cards. First things first, you need to know the rankings of the cards: A K Q J T (10) 9 8 7 6 5 4 3 2. Ace trumps all and 2 trumps nothing. Mix it up a bit; shuffle the cards to get an even play. Split the cards in half between you and your partner. Make sure the cards are faced down. Neither you nor your partner should be able to see your cards. One, two, three… flip over the card that is on the top of your deck. The player with the higher card wins the round and takes both cards to add to their hand. Have the same card when you flipped it over? This means war. Place three more cards face down on your seat out of your deck. Flip over a fourth card, whoever has the higher card wins all cards from the round. If you do not have enough cards to play the war, the player must turn their last card face-up. Play until one of you wins the entire deck. I spy something green…I spy something square. Remember that game where you say you spy something out the window and the people you are with have to guess what you saw? Yes, this game is still a thing, and we love it. We have large windows on all of our buses, so you are always guaranteed to have the best I Spy game yet. You don’t need any equipment, just your eyes, a window, and some sunlight. How many X’s and O’s can you get in a straight line? Paper and pen are the only necessities for this game and trust us; it could go on for hours. Play 5 to 10 rounds and keep score with a friend. Bet the loser buys ice cream. Need to break the ice between you and the person next to you? This is a game you can play with friends you just met or friends you have known for years. Get to know someone with “would you rather…” This game is pretty simple. You go back and forth asking eachother a series of questions where one person must pick between two different scenarios. For example, would you rather eat a rotten egg or jump in a pool full of worms? Not answering is not an option. While not wanting to take a bus isn’t everyone;s first option, the great thing about riding in one is being able to relax on the ride. You don’t have to battle traffic or keep your eyes on the road. Sit back and relax and let your eyes wander. While you are looking at all the cars passing you by, search the road for cars that have an out-of-state license plate. Once you spot one (gently) slug your friend in the arm. It’s a variation of the punch buggy game a lot of us grew up playing. Make the game interesting by searching for specific kinds of license plates. For example, plates that are from states that begin with a certain letter, end with a certain number or are from a specific state. Keep track of state plates that are different from where you’re from, and see if you can gather all 50. Start with “A.” Look out the window and search for a word that begins with your letter. Move and groove through the alphabet until you have reached “Z.” Signs and any objects with words on them is fair game. Keep your mind engaged with you take in the scenery. With all the technology aboard our bus, why not try an old-fashioned game of Hangman. If you have never heaerd of Hangman, here are the rules. One person thinks of a word that the other person has to guess in a certain amount of tried. Each time the person guesses a letter that isn’t included in the word, a line is added to the hanging stick figure. Once the man is “hung” you lose your turn. As morbid as it sounds, it can get pretty competitive depending on your level of difficulty. Try and be the person who creates the longest word or phrase and see if your friends can handle it. Paper. Pencil. Stick figure. You’re welcome. We understand that rocking out to your favorite jams is essential to a successful road trip. Thankfully, our vehicles come equipped with Wi-Fi and power outlets. How well do you know your music? Play a couple songs on your phone or computer and try to stump your friends. Let’s see who has been putting their Shazam app to use. Sharing music isn’t only a fun way to enjoy your time with friends, but to also showcase your interests and musical taste as well. Warning: this is extremely fun and may cause impulsive dance moves. Up for a game where you have to test your geography skills? This is not your ordinary school lesson. Impress the person next to you with all the places you’ve been. List the capital of every state in the U.S. and then move to countries around the world. Throw a wrench in it; if you are traveling across multiple states, try and name all the cities in the current state you are in. Good luck! This game requires some creativity; so don’t be afraid to utilize a fun moment from your trip to complete the tale. The first person starts off a story with 4 words, then the next person adds 4 more words to it and so on. This could get crazy, so fasten your seatbelts. You could up the ante by setting parameters to the story. It can have a theme or be set to a specifc place or time period. The harder the better. See how long you can go before someone gets stumped. 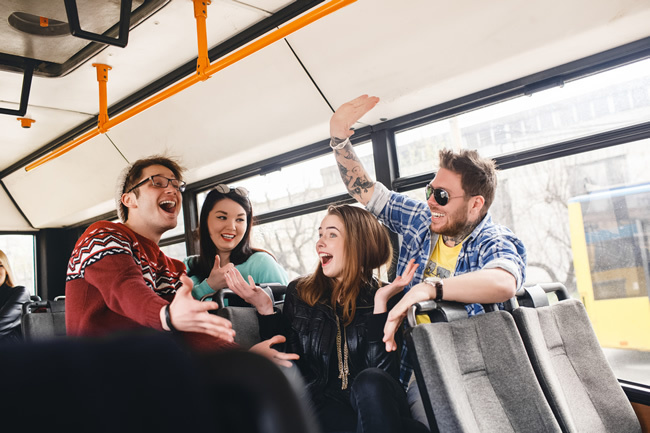 Whether you are playing one of the games above, or want to dive into the newest game like Cards Against Humanity, don’t let your bus ride be stale. Enjoy your time traveling between destinations and use your mind to pass the time. Stay tuned for more advice on how to make your trip the best one yet. May our on-the-road games knowledge find you well and remember, every great trip begins and ends with GOGO Charters. Need To Rent A Charter Bus? Or call 855-826-6770 for a free quote today. Agents available 24/7!